Meal Prepping, simply put, is preparing your meals in advance and in a reasonably large quantity. For example, cooking about a weeks worth of meals at one time, versus cooking each day. The sites focus is to help you prepare your daily, weekly, etc. meal preps by giving you multiple options on what to cook. The sites focus however, is to provide healthy alternatives to your everyday recipes with an emphasis on catering to unique dietary restrictions. We are busy, between work, social life, significant others, and car troubles, many things take up our time. As such, it is not always easy to cook every night. Well, in comes Meal Prepping. By Pre-preparing your meals, you are able to enjoy the rest of your breakfasts, lunches, and/or dinners by pulling out that pre-made container of deliciousness and eating without delay. When Should I Meal Prep? Meal Prepping does not have to happen on any specific day, but typically it is easiest to align it with the beginning of the week. Either Sunday or Monday. The hardest part is deciding not how, but what and that is what this site hopes to solve. Take a look at main dishes, and side items, or just browse our general recipe list. Once you do decide on your preferred culinary pathway, it’s time to gather ingredients. Make sure alongside the actual food, that you have a way to store it all. 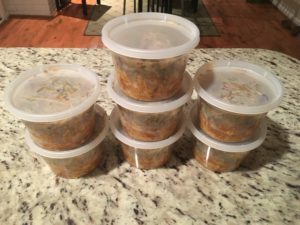 I use these containers , as they are inexpensive, reusable, and microwave safe. You should have a basic understanding of your goals and with that in mind it is time to start fixing your meals planning your calorie intake appropriately. Meal Prepping requires the right equipment. I personally use these Deli Food Storage Containers to store my weeks meals. They’re 16 oz and super cheap. The lids stay on, almost too well and their size makes them useful for most food items. Time to pick out your next meal prep!